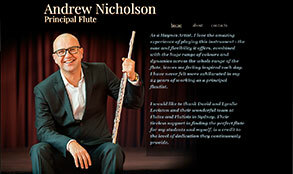 Andrew has recently performed with the China Philharmonic Orchestra in Beijing and coached the woodwinds of the National Youth Orchestra of Australia at their Summer Camp in Adelaide 2015. 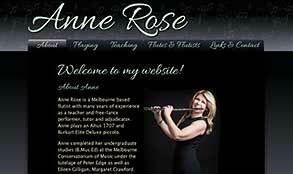 Anne is a Melbourne-based flutist with many years of experience as a teacher and free-lance performer, tutor and adjudicator. Playing the flute for Anne includes anything from small ensemble work with a variety of ensembles to musical theatre in the cramped confines of a theatre pit. She has performed extensively as part of many different ensembles; The Victorian Flute Ensemble, Melbourne Winds and Melbourne Opera, just to name a few. A passionate music educator, Barbara has taught instrumental music for twenty years in Melbourne schools and in her home studio. She has enormous experience working with primary and secondary students in independent and government schools. Barbara has successfully prepared hundreds of students for AMEB examinations, Victorian Certificate of Education performance study and tertiary auditions. Praised for her "gorgeous honeyed tone" (Sydney Morning Herald), Emma Sholl is one of Australia's finest flautists. 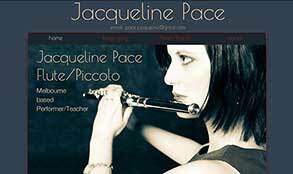 Jacqueline has appeared as a guest artist with the Monash University Flute Ensemble at the Australian Flute Festival and has been added to the casual list at Orchestra Victoria. 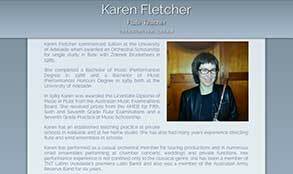 She is also a woodwind teacher and volunteers as a content manager at Flute Tutor Australia, which promotes flute playing and flute-related events. 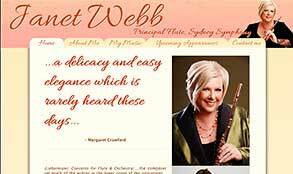 Janet has had a distinguished career in the Sydney Symphony Orchestra,holding the Principal Flute position since 1985. She has also appeared as guest principal with many orchestras, including the Sadlers Wells Ballet Company. Janet has performed as soloist with the Sydney Symphony, Singapore Symphony and the Ku-Ring-Gai Philharmonic on numerous occasions. Teacher and Performer. Chamber Musician and Soloist. Since 1992, Sylvie has developed a career as chamber musician and soloist. She has performed with many ensembles such as Ensemble Variante, Trio Vivace and Ariel Ensemble. 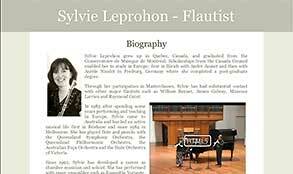 Sylvie teaches flute at Monash University, Genazzano FJC College and Kilvington Grammar. Performer, Teacher, Education Consultant. Teaching experience of thirty years. Music lectures at University North Beijing. Founder of Babies Music School. Karen has an established teaching practice at private schools in Adelaide and at her home studio. 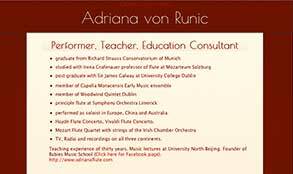 She has also had many years experience directing flute and wind ensembles in schools. Thanks for reading! We're just starting - building a hub for flute articles, news, and interest - and we need your help to spread the word. Please do tell EVERYONE who loves flute about this site. Did you like this article? Did you hate it? Want more? We want your feedback. Please subscribe. We'll let you know when new stuff arrives, and we won't give or sell your info. You can subscribe at the top of every page on this site. Feel free to give any suggestions or feedback you can think of. We're all ears and we'd love to hear from you. 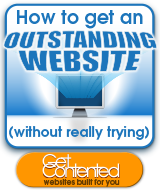 If you're in the market for a website, we can help with that - click "get a webpage" at the top of this site.